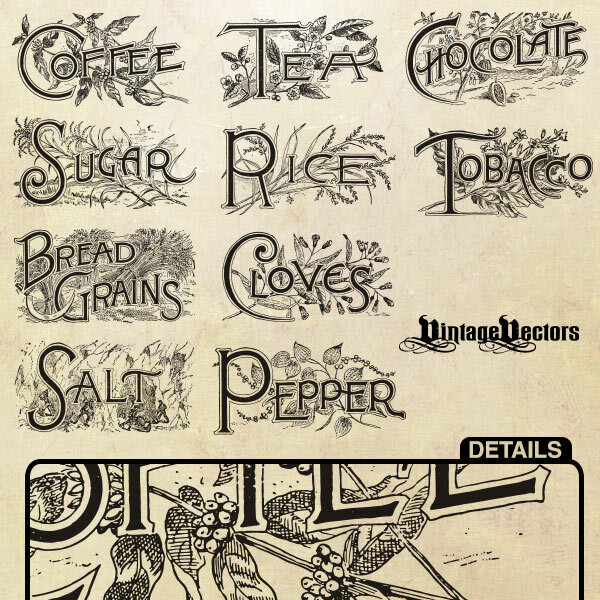 I’ve vectorized more antique emblems of common things from yesteryear. This time it’s Bread Grains, Chocolate, Cloves, Coffee, Pepper, Rice, Salt, Sugar, Tea, Tobacco. This free download is an Illustrator PDF – pure vector art (9.5 MB). These old emblems, signs… not sure what to call them, but they can be used for commercial works. How very cool! These would be neat to print, cut out and use in the kitchen. I love the vintage-ness! But, that is your forte, eh? I sure do thank you!